Falcon Geofoam is your source for Elevation Geofoam. With one of the largest EPS Geofoam production facilities in North America, multiple plants, UL certification and competitive pricing there is no reason to look anywhere else for your geotechnical solution! 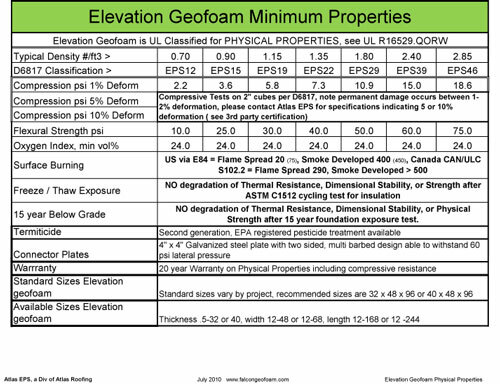 Elevation Geofoam (or Geo Foam) is not the commodity white foam typically found in your local hardware store, it is a stronger engineered EPS foam for an engineered geotechnical solution. Geofoam is a lightweight, rigid foam plastic (EPS – Expanded Polystyrene) that has been used around the world as a fill for more than 30 years. It is approximately 100 times lighter than most soil. This extreme difference in unit weight compared to other materials makes it an attractive fill material in both transportation and non-transportation applications. EPS geofoam also reduces lateral stress encountered with traditional materials, especially in embankment situations. Atlas EPS is an “EPS block molder” that has been in business for over 40 years. As a division of Atlas Roofing Corporation, Atlas EPS has great depth of technical resources and a strong financial foundation. Atlas has 3rd party certification for a variety of construction applications, including certification by Underwriters Laboratories to ASTM D6817-07, the recognized industry standard for geofoam applications. With an Engineering Department and separate Quality Assurance Group Atlas EPS can offer you the product solutions you require for any EPS foam application. The value chain is petrochemical-based: that means its cost is correlated to the cost of oil. Below is an example of approximate cost of Geofoam compared to cost of oil. Selecting the correct material for your project is important. If underspecified, the project could fail. If overspecified, money is wasted on extra strength that goes unused. We urge our clients to contract with a civil engineer to help specify the correct grade of product. In general, the engineer will use the dead load of ballast and topping materials, the live load during use (such as traffic), and a safety factor to assure the correct maximum loading is calculated. From this, the load can be converted to pounds per square inch (psi). Then it is simply a matter of selecting the grade from the table that exceeds this psi value at 1% compressive deformation. Falcon Foam, a division of Atlas Roofing Corporation, has been renamed “Atlas EPS” to reflect its leadership position in delivering innovative, energy-saving solutions and products for the expanded polystyrene (EPS) insulation industry.